Have you heard the incredible news! 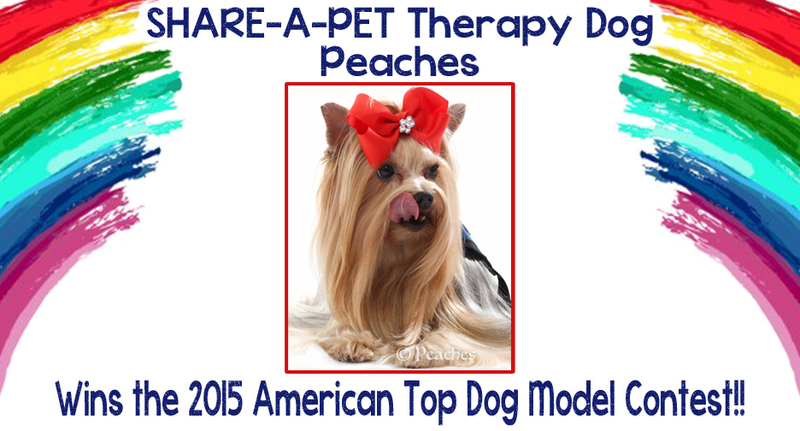 Peaches has just won Americas Top Dog Model Contest for 2015! Read all about it… We are so proud of her!!!!!!!!!!!!!! Americas Top Dog Model (R) Helping Paws 2015 contest has ended! It was a very, exciting, journey! This competition focused on the numerous ways that dogs make a difference by helping people. We received many wonderful entries on this topic. I hope this year’s competition was inspiring and fun for all of our contestants. 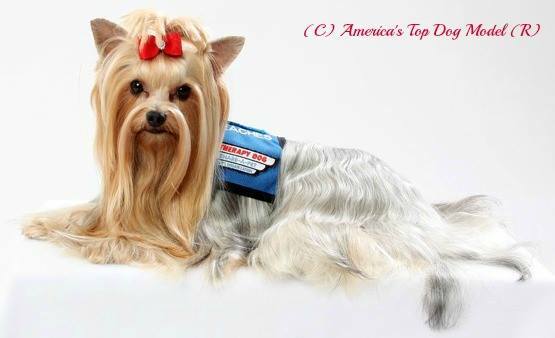 America’s Top Dog Model (R) national contest winner is “Peaches,” a glamorous, Yorkshire Terrier from Lake Worth, Florida. She is a certified pet therapy dog for Share-A-Pet. In Peaches’s winning contest story, her human mom, Claire Spielman shared her heartfelt story about how Peaches makes a difference in the lives of so many people through her therapy work. “Peaches has brought so much joy to children in homeless shelters and hospitals. She also visits patients in nursing homes, but she seems happiest working with children,” expressed Claire. Claire and Bob Spielman have raised Peaches since she was twelve weeks old. She graduated from the Share-A-Pet organization after over a year of training. Eleven Finalists will be featured in America’s Top Dog Model (R) Calendar and website along with the Top Dog model winner and receive a Celebipaws Rhinestone tank. And thanks to our latest contest sponsor Pawz, America’s Top Dog Model ® finalists will also receive Pawz dog boots. 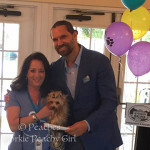 We are honored to have Peaches represent America’s Top Dog Model (R) organization. She serves as a perfect example of a “top dog model” that makes a difference. Congratulations and best wishes to America’s Top Dog Model (R) 2015 Contest winner, Peaches and her family.